It’s no secret that I love riding holidays and in writing this blog I’ve been lucky enough to experience some of the best in the world. Here is recap of my top four destinations and horse related escapes which you will find difficult to beat! Great open range riding in a stunning sun drenched landscape with beautiful, intelligent horses who will look after you however well you ride. Combine this with fantastic Mexican hospitality and food to die for in a five star boutique ranch and you have found Rancho Las Cascadas About one and a half hours North of the mad metropolis of Mexico City, this is an exceptional place where I guarantee you will wake up every morning in your cosy Casita with a smile on your face at the thought of the day ahead. Rancho Las Cascadas, set 7,500 feet up, next to the waterfalls after which it is named, is a combination of first class Swiss management combined with the warmth and friendliness of the Mexican personality. ﻿The jewel in the crown for me were the amazing horses and the breadth and variety of terrain available for us to ride across. If you’ve ever ridden in England you’ll know the tedium and risk factors of riding on busy roads and having numerous fences and gates to contend with. 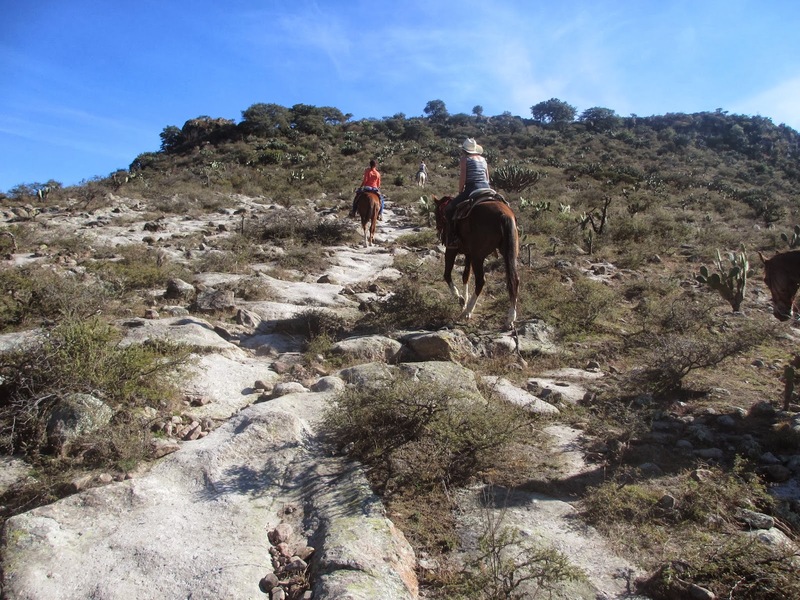 If you’ve ever ridden in the states you are often not allowed to get above a trot when you’re out trekking. There are no such barriers here. 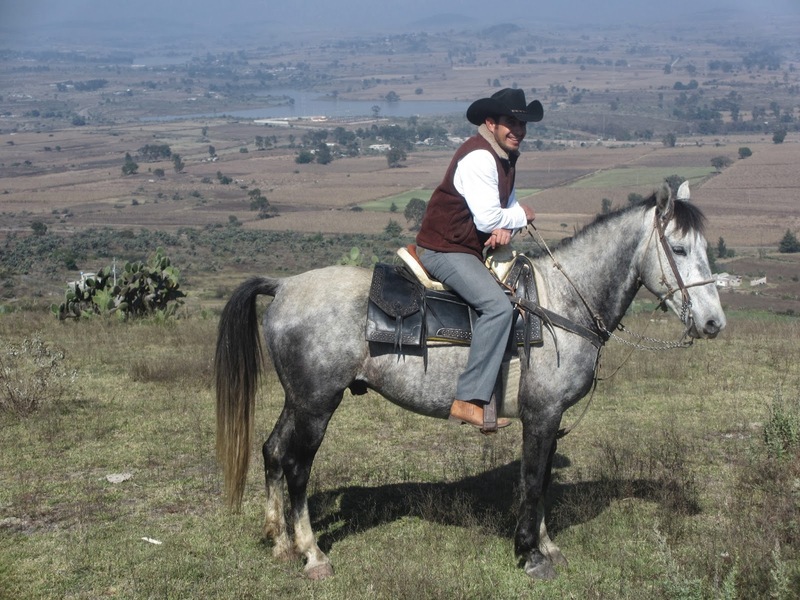 The horses are fast and sure footed and you can canter for long periods on every ride, across corn fields, mountain tracks and wooded trails. No fences, no gates, just huge open spaces and a big blue sky. The horses are something special. 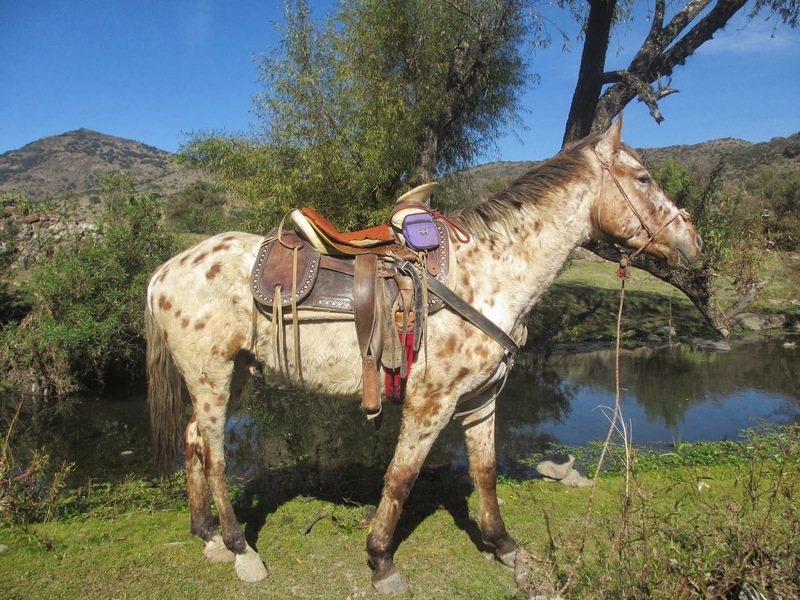 They are Criollos, a tough, sensible and athletic breed of Spanish origin who can climb out of a rock canyon like a mountain goat, match the Arab for endurance and stamina, while also being able to put on an impressive turn of speed when required. ﻿They are also the prettiest colours. Bay, Dun (Buckskin if you’re American) Chestnut, Palomino, Grey, black, and my favourite – Appaloosa. There are over 30 horses to choose from on the ranch and they all have beautiful names. Alessio, Apache, Allegro, Gitano, Cherokee, Paloma, Picasso, Versace, Vivaldi, Diamante, Mariachi, Gigolo (a stallion.) I could go on. I rode a different horse every day but my favourite was Capriccio, a brown Appaloosa three year old who was furry like a teddy bear, and had the sweetest nature. 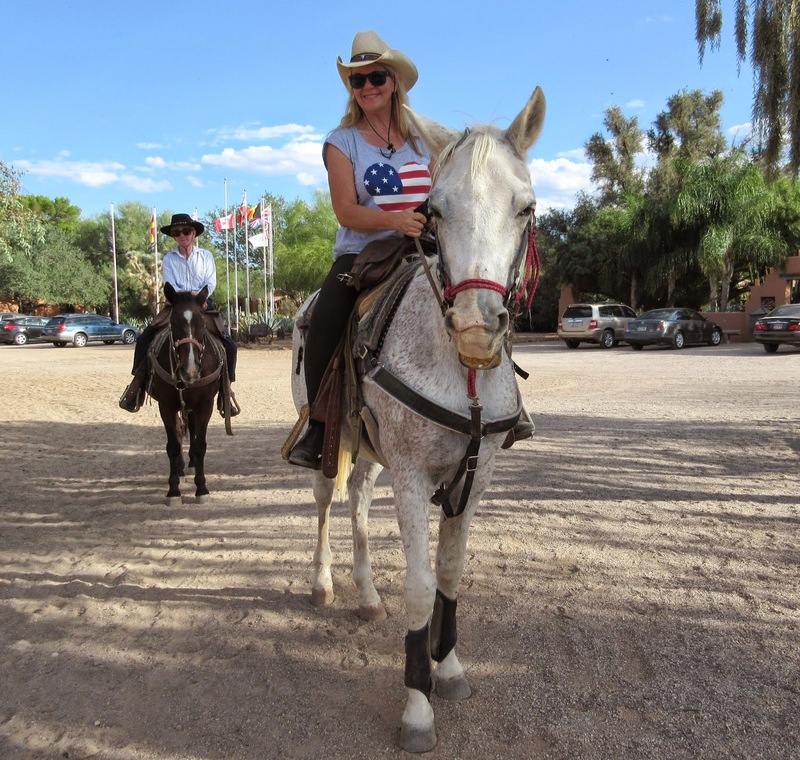 The White Stallion Ranch in Tucson, Arizona has its very own Wild West story. Originally built in the 1900s, it started out as a cattle ranch, but has been a guest ranch for some seventy five years. Owned by the True family for the last fifty of those years, it is a slice of genuine old Americana, but with modern facilities. The charming adobe guest rooms have fabulous cacti and desert flowers surrounding them and each has authentic Western themed decor. I was there in October and the weather was still over 90 degrees (30 C) making this an excellent winter sun choice for those of us from less sunny climes. 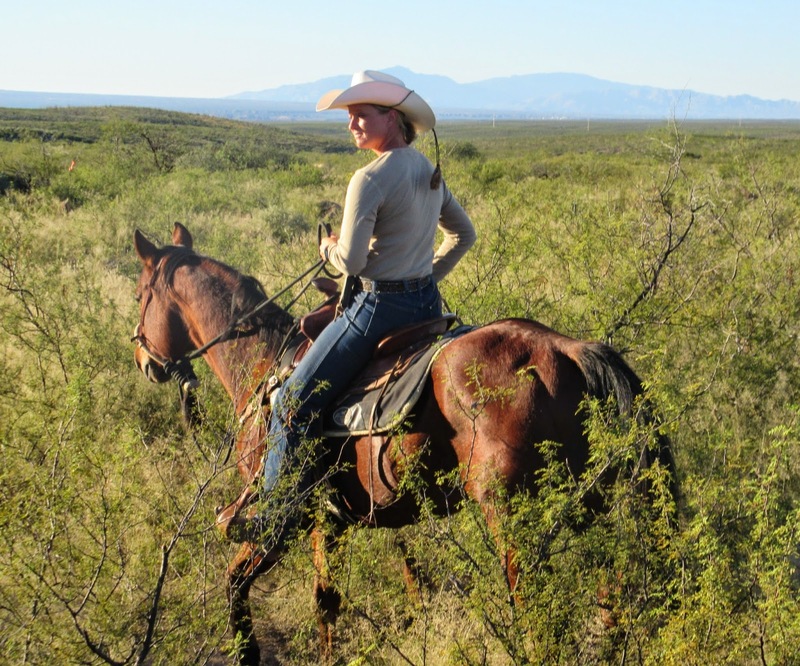 There are a wide range of trusty steeds to choose from on the ranch to suit every different ability, from the complete novice to the accomplished equestrian. 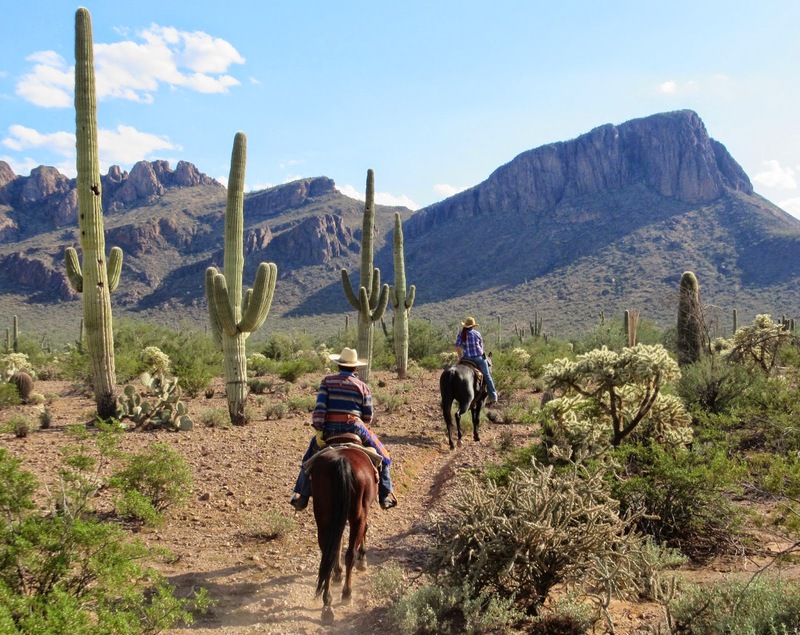 There are slow rides and fun fast rides, which have lots of cantering through the cacti on the menu. The horses are pretty much bombproof and sensible enough to deal with a wide variety of passengers. The ranch prides itself on not having a weight limit for guests and there are some real gentle giants here. I went out a couple of times with Big Bill, who is crossed with a draft horse, leading the ride. White Stallion wranglers are really friendly and helpful and make guests feel immediately at ease, which is extremely important. They need to be people people, as well as horse people. This ranch is open year round, unlike many, and the climate is so warm here pretty much all the time, that most meals are taken ranch style out in the open air and you will definitely not go hungry. The White Stallion Ranch is now one of only a handful of guest ranches in the area, where once there were about a hundred. 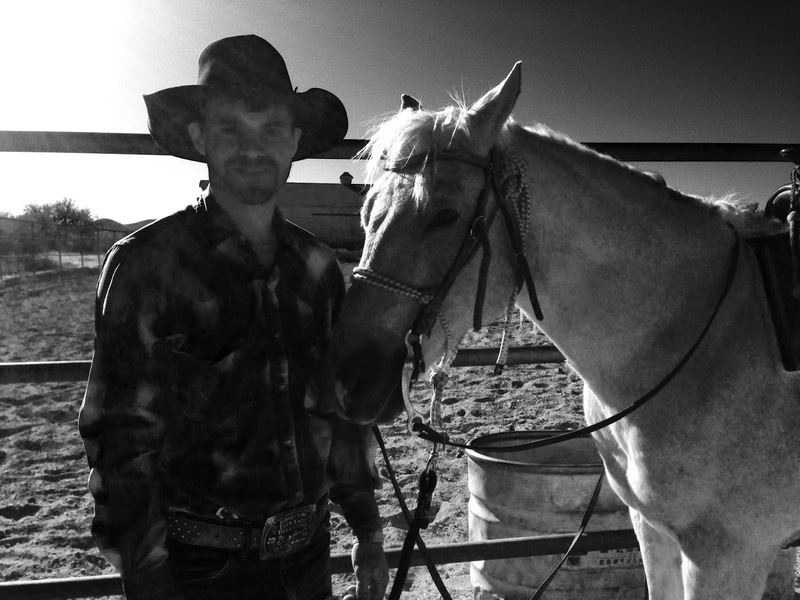 Russell True summed up the ranch’s success story when he said “You need a good system, great wranglers and good equipment, but if you’ve got the wrong horse, you got nothin’ ” Exactly! There aren’t that many things which make me break out into an uncontrollable grin, but riding around the Castle Leslie estate on Fernando the hunter on a beautiful late spring day is right up there. A two day trip to a premier equestrian centre in county Monaghan, in the lush Southern Irish countryside, was a very good idea indeed. Eighty minutes drive from Dublin, Castle Leslie boasts a combination of luxury accommodation in the Castle, the Lodge and in self catering cottages plus a leading equestrian centre. The estate has over 300 cross country jumps for all abilities and the riding centre has a first class indoor school, outdoor school, highly experienced instructors and even a virtual horse! They can cater for everything from the novice to the advanced rider in beautiful surroundings. The horses are all, well, happy. They are well schooled and forward going, a dream to ride. They are beautifully turned out, well shod by the regular farriers, and even have a visit from the chiropractor every week. I loved my huge Irish hunter Fernando who gave me lots of confidence, enough even to try a few modest jumps. The estate around the castle has 1,000 acres of rolling Irish countryside with ancient woodland and a huge glittering lake. ‘Glaslough’ the name of the village is translated as ‘calm or green lake’ and here is that very lake where you can fish for pike, take out a boat or just wander your horse into it for a paddle and a drink. There was even the chance to try riding side saddle. Riding side saddle involves winding your legs sideways through a leather pommel and balancing in what looks like an entirely unnatural position. Ladies had to use these in days gone by as it was considered unladylike to ride astride. 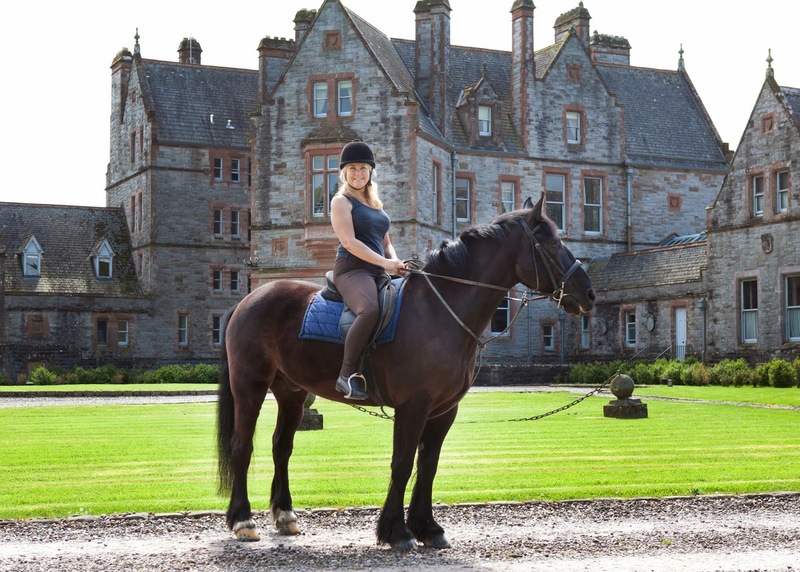 It has retained a speciality equestrian niche even in the modern world and Castle Leslie is certainly the only place I’ve come across where you can try it for yourself. Wearing the outfit helps get you into the swing of things. Castle Leslie is unique in that there is no other castle estate in Ireland where the founding family still live there. Indeed Captain Sir John Norman Ide Leslie, the 4th Baronet (known as Sir Jack Leslie) is still in residence. At the age of 97 he can still be seen around the estate having dinner or chatting to guests. Whether you want to hack out, jump cross country or learn to ride from scratch, the riding packages are really good value and the facilities are the best I’ve ever experienced. It really is quite a special place where you get the warmest of welcomes and the best that Ireland has to offer. Tombstone Monument Ranchis definitely one of a kind. The accommodation is purpose built as the main street of a Wild West town just two miles out of Tombstone itself. The hotel side of things is pretty up market with beautifully furnished modern rooms with a Wild West twist. I stayed in the Post Office but you could stay in the Courthouse, the Mining Office, the jail or even Kitty’s Bordello! There’s a pool and a Jacuzzi too to soak your saddle sores away should you so wish. In the evening you can make your way to the Trappman saloon across the street for a shot of hard liquor, a beer, or some of the special blend on tap Margaritas. 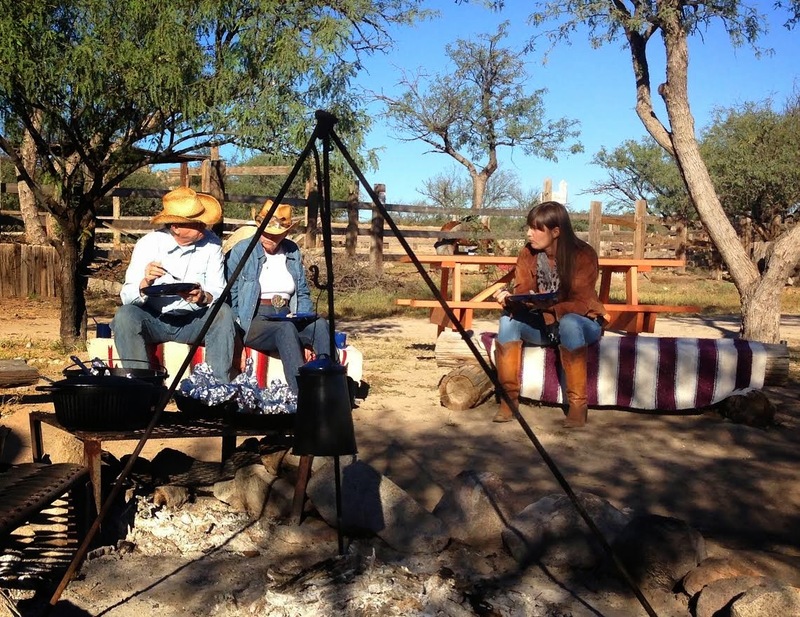 ﻿The Tombstone Monument Ranch﻿﻿ gives you the opportunity to live out your Wild West dreams as far away from the rat race as you could possibly get. This ranch is as unique as a gold nugget and you need to saddle up your travel plans and get there before the Gold rush starts!